The ring is beautiful and perfect for what I was looking for. Shopping on the Danforth website was informative, easy, and very helpful in making my purchase. Thanks! 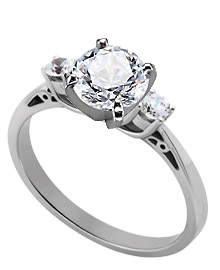 This is a beautiful 2.3 mm 14k white gold engagement ring. The ring is detailed with scroll work in under bridging and prong set with two matched round brilliant cut diamonds. Each has a weight of .08 carat, a color of G-H, a clarity of SI, and is set on opposite sides of the center diamond for a total carat weight of .16 carat.